"A family run business offering a lifetime of local knowledge"
We are a family run business, based in Stromness. 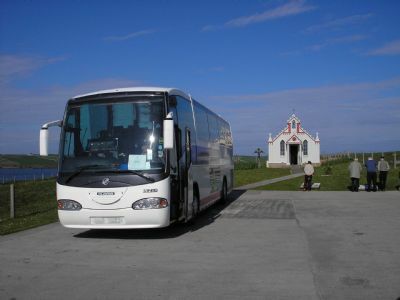 As a husband and wife team, both born in Orkney, we are proud to be the only coach hire company in the islands operated by Orcadians. Our business was established in 1998, initially operating taxis and minibuses, then expanding into coach hire. We have 15 coaches varying from 49 to 55 seats, a 33 seat midicoach, a 16 seat minicoach as well as two 16 seat minibuses and also 2 bendy buses, all available for hire. Amongst the local community we have a good reputation for reliability and offer excellent customer service at very competitive rates. Our coaches are clean and comfortable and we employ experienced local drivers. We pride ourselves in providing a professional, efficient and friendly service, with attention to detail you can only expect from a family run business.